My 14 Day Detox Tea by Fit by Dezign arrived in a beautiful well made package. I believe it might be made of mylar, which I love, because it makes it ready to go for long term food storage! It also included a welcome message that offered a discount on my next order, as well as a chance to become a VIP Priority Member (receive discounts and offers from 14 Day Detox Tea by Fit by Dezign)! The first sip of my tea seemed a little minty, and while not too good, it was more than tolerable. As time went on the taste became welcoming and familiar. Now I would drink this all the time if I could! The taste is no longer minty to me. It has an earth note, and its own sweet tones that journey its bouquet across your tongue like a wild rapid. During my tea use I followed a healthy diet, not much different then my everyday one now, and I didn't do any exercise or extra walking. I still lost a tremendous amount of weight using 14 Day Detox Tea by Fit by Dezign, 10 lbs, when I was only expecting to lose two or three. I will be using it again for sure! My favorite surprise about 14 Day Detox Tea by Fit by Dezign were the beautiful triangle design of the bags. I also loved the materials used to house the tea. The tea was visible and exquisite to behold! I received a sample of this product in return for sharing my honest feelings about the product in a review. 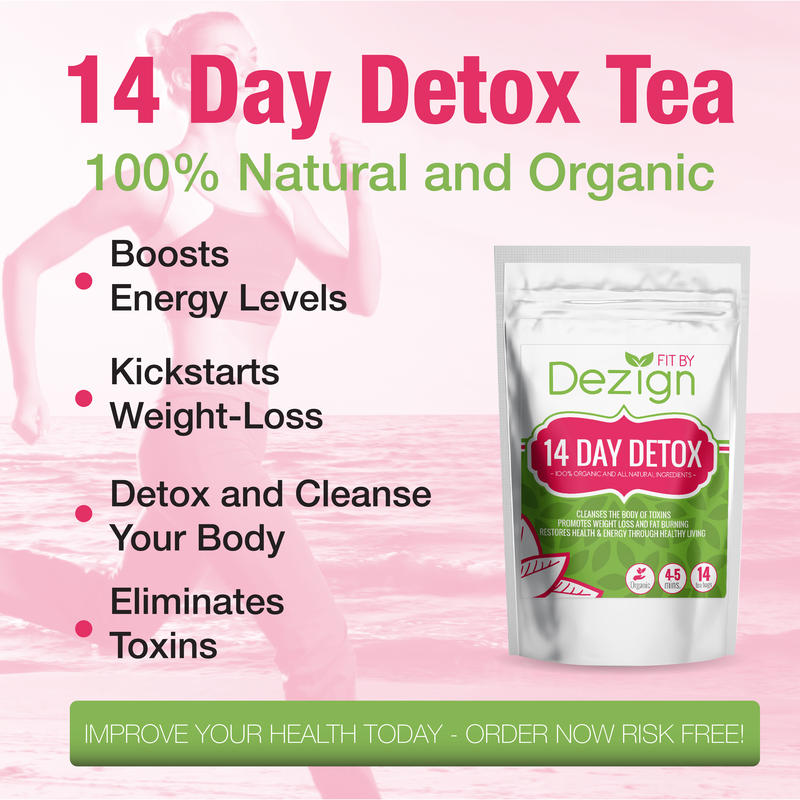 I think 14 Day Detox Tea by Fit by Dezign is wonderful and I'm sure you will too! Today's world is filled with poison! We all know it is in the air, many of us are aware that it has invaded much of our food supply, it's even in our water! It is imperative that we flush these toxins from our bodies as often and as completely as possible. One of the simplest ways I have found to fight this war is by detoxing. Most of us hear the word detox and immediately assume you will have to deprive yourself from something to participate. That is NOT the case. If images of hunger, weird food, kale juice and colonics are dancing around in your head; allow me to wake you from your nightmare! Not all detox's require you to suffer! There’s another kind of detox that’s all about a fabulous, delicious, relaxing, and soothing drink. It’s a new kind of detox that’s a giant jumpstart for your health and a reboot for your metabolism. It’s fun, easy to do and a direct route to feeling fabulous. Detoxing has many benefits including reduced weight, stability, strength, liveliness and a general sense of well being....just to name a few. This tea will help you jump start your health and wellness journey. BODY CLEANSE - In today's environment, there's no way to get around toxins. They are in our food, water, and in the air. A build up of these toxins in our bodies can eventually be harmful to our health. ALL NATURAL - Our tea is made with all natural, vegan, and organic ingredients in their purest form. 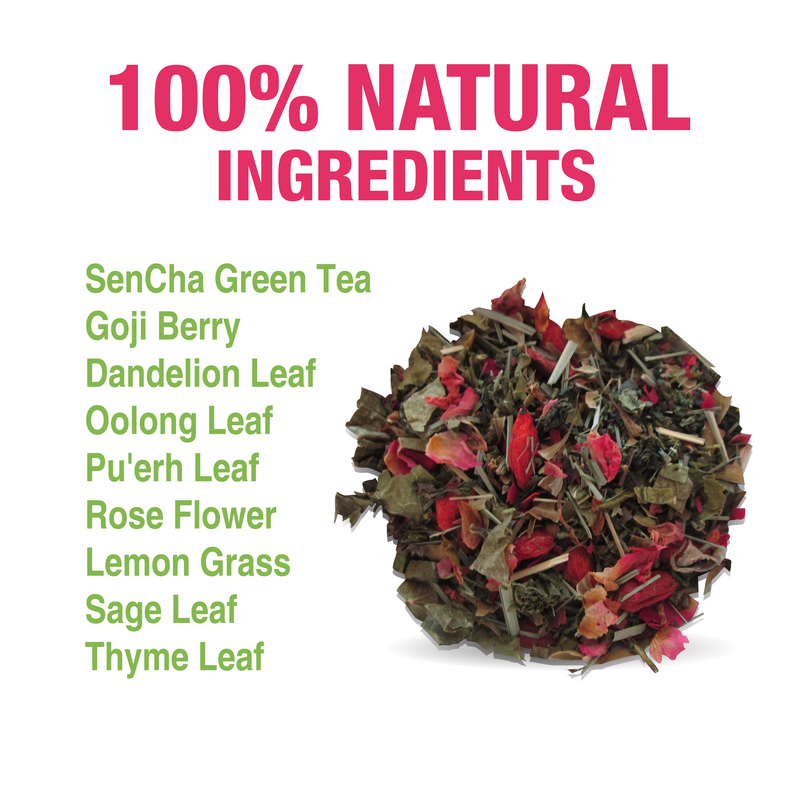 Ingredients include Organic SenCha Green Tea Goji Berry, Dandelion Leaf, Oolong Leaf, Pu'erh Leaf, Rose Flower, Lemon Grass, Sage Leaf and Thyme Leaf. All Natural, Healthy, and Tasty. At one point or another, you’ve probably heard about the magical elixir that is green tea. Filled with endless anti-oxidants, vitamins, and general goodness, it has become a staple part of many gym-goers and health-conscious people’s diets. Helps burn fat: The anti-oxidant features of the tea help speed up your metabolic rate, resulting in energy being burned, even when not active. Improves immunity: Fights against flu and colds. Super medicine: There have been reports that it can prevent and guard against certain cancers, arthritis, and diabetes. Re-hydrates: Going against common beliefs that tea dehydrates you, green tea has been found to have similar re-hydration effects to our old friend H2O. Neurological: Has been shown to prevent degenerative and neurological diseases such as Alzheimer’s. This is only just a small list of the benefits green tea offers. HEALTHY LIVING- Several of out customers have emailed us reviews and said that our detox tea is the best "Body cleanse drink" that they have tried based on all of the benefits that they receive from drinking it. Now for a warning: Some Detox Teas that combine caffeine with diuretics can trigger the loss of water weight. Just two cups of water weighs one pound on a scale, so shedding fluid can make you look and feel lighter and your lean-to-fat ratio remains exactly the same. 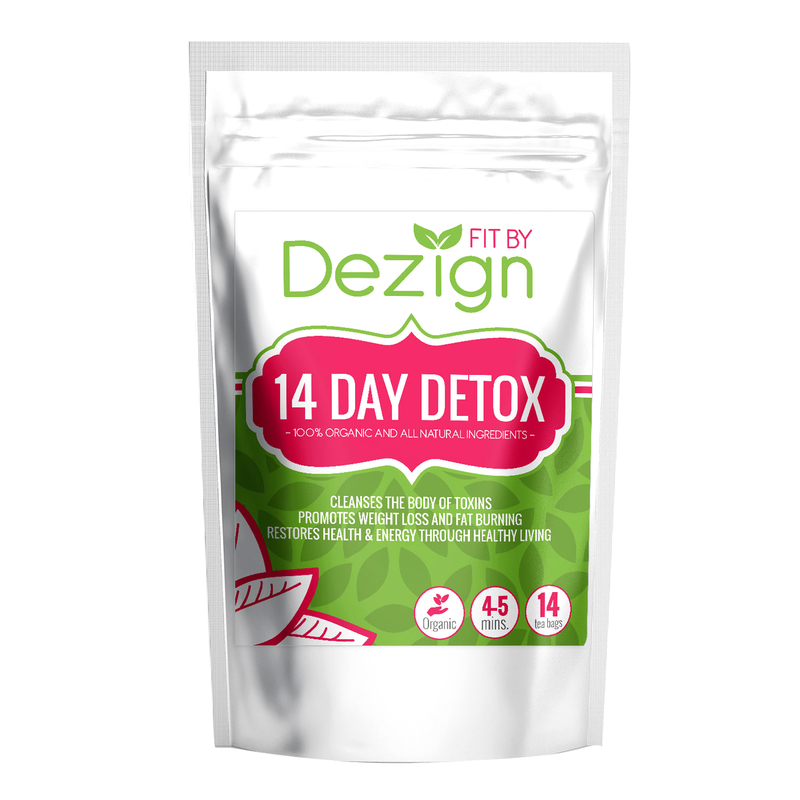 14 Day Detox Tea by Fit by Dezign is NOT a quick fix solution, but the beginning of a long term solution. It is meant to jump-start you on the path to wellness and is 100% safe and natural. Please feel free to post your results in the comments below so as that we can add to this study. It is not the clinical trial that Cynthia Sass was looking for I'm sure, however; it's better information then we have had in the past.